Do you wish to find a original and cost effective way to promote your medical practice or pharmacy business? Then invest in these personalized 2.25 x 3.5 mortar & pestle shaped full color magnets. It makes an ideal choice for rewarding loyal customers and strengthening brand equity. You can get it done with your company tag line, logo, contact information and many more. This magnet largely remains affordable for healthcare services and they can further cut down their budget by ordering it in bulk. 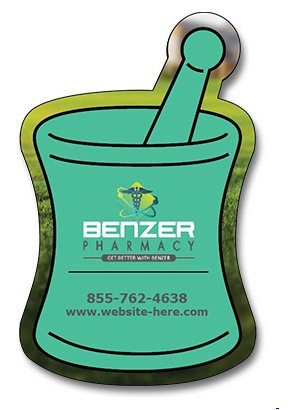 Request a quote to know bulk order promotional benefits on this custom mortar and pestle shape full color magnet. Product Size: 2.25 in. x 3.5 in.